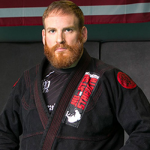 Matt Bryers is a Soul Fighters Brazilian Jiu-Jitsu Black Belt, a 3rd degree Kobukai Ju-Jitsu Blackbelt, co-founder of the TRITAC-Grappling System and TRITAC-Striking Instructor. He has been training Jiu-Jitsu, Combative Martial Arts, TRITAC-Martial Arts, Defence Lab: DNA Fight Science, wrestling, submission grappling, and many other martial arts for over 20 years. Matt is also a strength and conditioning coach at Cage JSA. He is a Certified: Poundstone Performance Strongman Instructor, TRX Instructor, DVRT Instructor, and Kettlebell Instructor.